Streetwise Mobile Developement Tutorial: Steve Wozniak(Apple Co-Founder) with his Galaxy Nexus and a ice cream sandwich T-shirt to go with it. 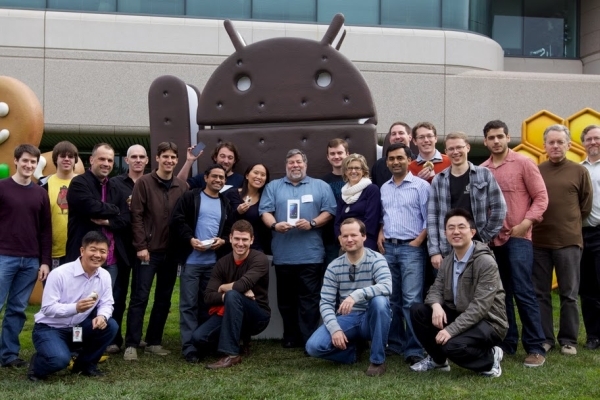 Steve Wozniak(Apple Co-Founder) with his Galaxy Nexus and a ice cream sandwich T-shirt to go with it. Heck of a Strange thing happened in Google's campus in Mount View when Steve Wozniak the co founder of apple became the first person in US to get the Samsung Galaxy Nexus. This all happened when "Woz" tweeted that he was looking for the Samsung galaxy nexus ,but unfortunately it was not available in US.So "Woz" was invited by the Google's campus in mount view where he was presented the Brand new Samsung galaxy Nexus and a ice cream sandwich T-shirt.